Plants mainly creeping, the apices and laterals erect, up to 3 mm tall, often much shorter. Attachment by means of unicellular haptera developing from the first cell of the simple and compound laterals. Laterals polystichously arranged, either unbranched and up to 25 (-45) cells long, or repeating the branching of the main axis. The latter type originating at intervals of 5 of more cells, at shorter intervals when arising (later) from older segments of the already prostrate parts. Prostrate axes up to 50 (- 60) µm thick, the unbranched laterals ca. 25 µm, the cells up to ca. 115 µm long, but young segments about as long as broad or shorter. Tetrasporangia pedicellate, single or in small clusters, usually additional to a normal lateral (single or compound) sometimes apparently replacing a lateral; sporangia cruciately divided, ca. 40-50 X 25-30 µm. Spermatangial stands additional to the normal lateral or replacing them, only little shorter than a vegetative lateral, with several segments becoming fertile, bearing ca. 5 spermatangium mother cells each with a few spermatangia. Female reproductive structure known only from one collection from East London, the carpogonial filaments formed on the basal cell of a two-celled branchlet. The post-fertilization events were not observed. Found from False Bay to Haga Haga (18-43). Epiphytic and epizoic (limpet shells, Pyura tests). Type locality: Simons Bay, False Bay, Cape Province, South Africa (Simons 1970). Note 1. A species mainly from the south coast (the Transkei material is now determined as C. tingitana). It is close to C. flexilis Baardseth, described from Tristan de Cunha, and Athanasiadis (1996) regards the two as a single species. Note 2. It has been remarked before that the sporangia appear to be larger on the Western Cape coast (i.e. West of Cape Agulhas): 60 X 40 µm (Stegenga 1988). Callithamniella capensis. 1. Microscopic habit. 2 Detail of prostrate axis with base of determinate lateral, juvenile indeterminate branch, and hapteron. 3. 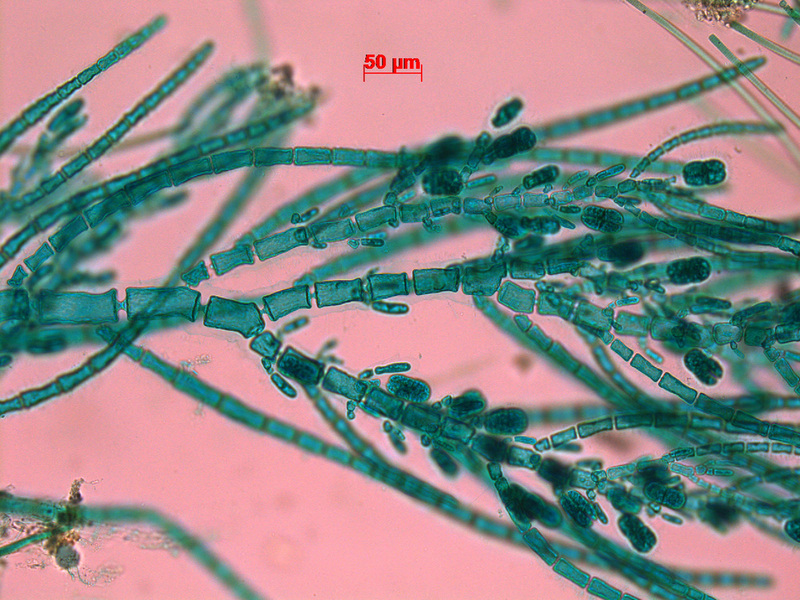 Tetrasporangia. Reproduced from Stegenga et al. (1997). Callithamniella capensis. 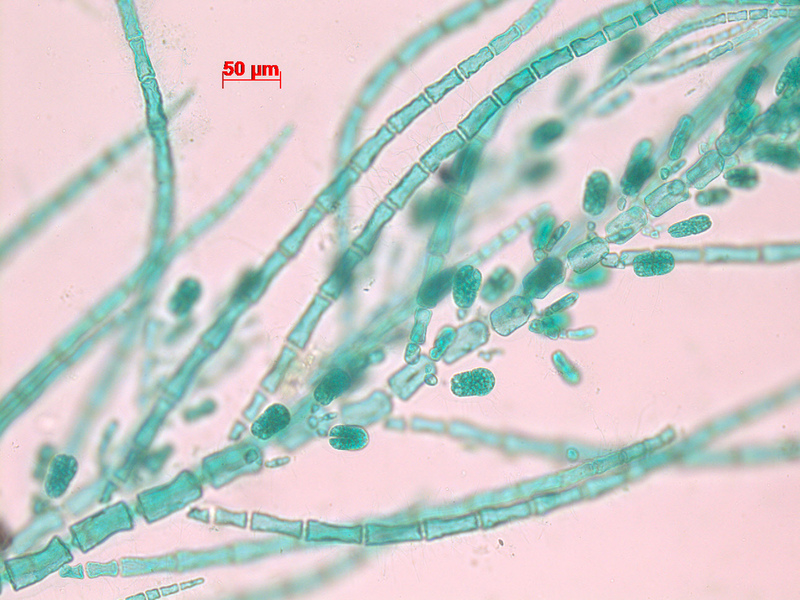 Microscopic habit showing tetrasporangia. Stained slide material, Woody Cape. Callithamniella capensis. Microscopic habit showing tetrasporangia and polystichously arranged laterals. Stained slide material, Woody Cape. Athanasiadis, A. 1996. Morphology and classification of the Ceramioideae (Rhodophyta) based on phylogenetic principles. Opera Botanica 127: 1-221. Simons, R.H. 1970. 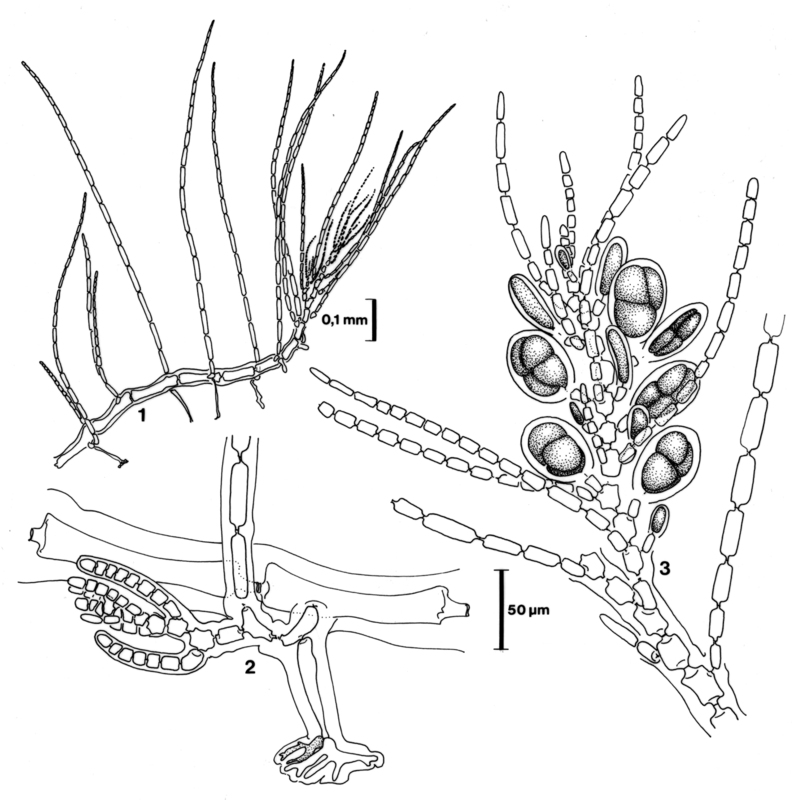 Marine algae from southern Africa. 1. Six new species from the inter- and infra-tidal zones. Investigational Report Division of Sea Fisheries South Africa 88: , 1-13, 11 figs. Stegenga, H. 1988. Notes on the Ceramiaceae (Rhodophyta) from the eastern Cape Province, South Africa I. New records and remarks on morphology. Blumea 33: 371-393..